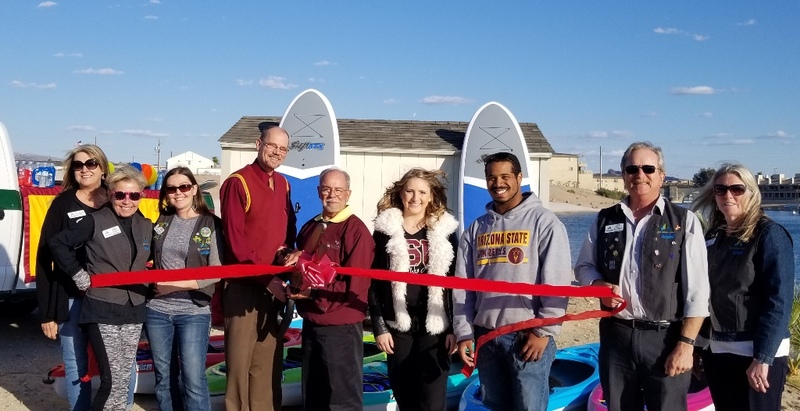 The Lake Havasu Area Chamber Ambassadors held a ribbon cutting ceremony for ASU Colleges at Lake Havasu Outdoor Pursuits Club, located at 100 University Way. The ASU Beach Hut will house ASU Havasu beach equipment such as paddleboards, kayaks and mountain bikes. 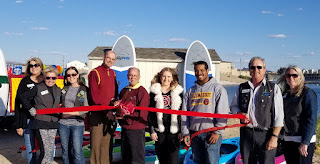 The Tuff Shed Beach House was donated by Home Depot, the kayaks donated by the Davey family and the mountain bikes donated by Mohave State Bank. ASU students will pay a $20 per year fee to use the Hut and equipment during the Fall and Spring semesters. ASU Havasu is gaining students who are natural outdoor enthusiasts, and Lake Havasu City is the perfect place for these opportunities. Attending the ceremony from left to right were Lisa Krueger, Kathy Baumer, Cassie O’Hara, Raymond Van der Riet - Director ASU at Lake Havasu, Mayor Mark Nexsen, Cimmaron Davey, Cortez Croney, Steve Bentley and Audrey Hoyt.